Cape Town - Utility back Cheslin Kolbe has his sights set on playing for the Springboks at the Rugby World Cup in Japan later this year. The 25-year-old, who currently plies his trade at French club Toulouse, says 2018 was a dream come true when he made his Springbok debut and went on to win seven caps. 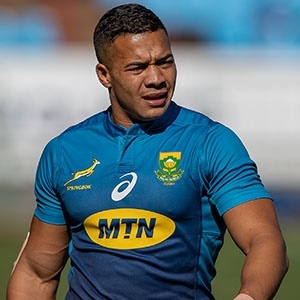 The versatile Kolbe, who can play either wing or fullback, told the fiekie7.co.za website that he was looking for more of the same in 2019. "We are blessed with lots of quality outside backs in South Africa and I see that as a positive for all of us, because that keeps us all on our toes and can just improve each and everyone's game. Definitely giving everything I have to be part of the 2019 Rugby World Cup in Japan and will just play the best rugby I can. "Last year was a dream come true for me. Being called up to the Springboks and making my Test debut is something I will cherish for the rest of my life. I've learned so much as a player in the time I've been a part of the Boks and I'll keep on learning. I had the best time with the brothers, it's really a good team culture and atmosphere. No egos." Kolbe added that he'll play anywhere Bok coach Rassie Erasmus prefers him. "I'm comfortable and having fun at both wing and fullback. To me it's a similar job. At fullback you have more time on the ball and have to make clever decisions from the back. So I'm happy to play either of the two as long as I can add great value to the team and that my performance will be to a great benefit for the team." The 2019 Rugby World Cup is scheduled for September 20 until November 2.